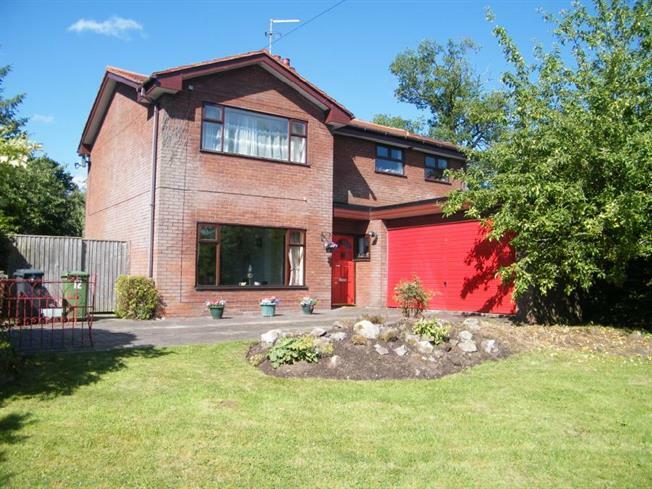 4 Bedroom Detached House For Sale in Winsford for Offers Over £260,000. Are you looking to be in a semi rural location, yet still within close distance to the town centre and local schools. Location is the key word for this four bedroom detached family home that has a refurbished kitchen and bathroom with potential for extension (subject to planning permission). Arranged over two floors the property briefly comprises; entrance hall, downstairs cloakroom/WC, spacious lounge that leads to the conservatory, modern fitted kitchen/breakfast room and a dining room. To the first floor is the master bedroom with a dressing room, three further bedrooms and a family bathroom. Externally to the front, access is gained by wrought iron gates to the driveway which provides ample off road parking further leading to a double garage. With gardens to the side and a pathway that continues to a paved patio area to the rear and an additional garden that extends to the side. Door to front elevation with frosted side panel, cupboard housing oil fired central heating boiler and stairs to first floor. Low level WC, wash hand basin, base cupboard with complementary worktops, radiator and frosted double glazed window to the side elevation. Double glazed window to the front elevation and a radiator. Brick and uPVC construction, double glazed windows and doors to the rear garden, light, fan and a radiator. Modern fitted kitchen with a range of wall and base units, complementary work surfaces incorporating one and a half bowl sink unit with single drainer and mixer tap, tiled splashback, integrated electric double oven and four ring hob with extractor over, space and plumbing for washing machine, dishwasher, fridge freezer, radiator, double glazed windows to side and rear and stable door to the side elevation. With an opportunity to convert to an 'en-suite' with this being adjacent to the main bathroom. Double glazed window to the rear elevation, fitted wardrobes and cupboards with mirrored doors and a radiator. Double glazed window to rear elevation and a radiator. Low level WC, vanity style front unit, panelled bath, fully tiled shower cubicle, part tiled walls, two chrome ladder style radiators, airing cupboard with hot water cylinder and shelving and two frosted double glazed windows to the rear elevation. To the front of the property are double gates leading to a driveway providing off road parking, long garden, further lawn area to the side, paved pathway that continues to the rear of the property with additional lawn area. The Garden extends to the other side of the property with an additional paved patio area. Electric up and over door, light, power, electric meters and an oil tank.